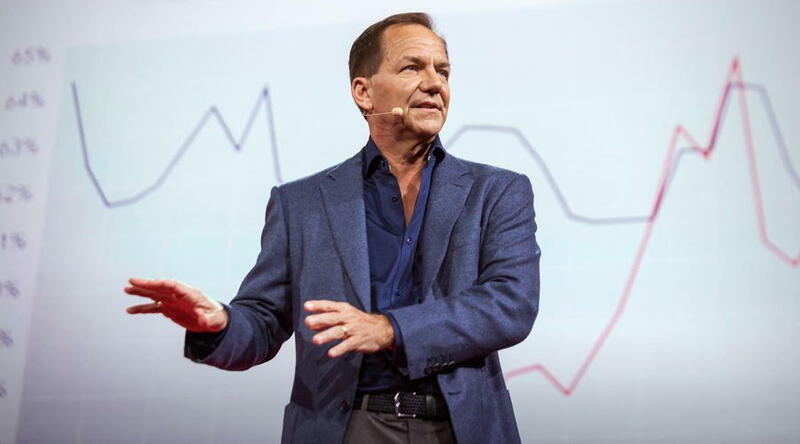 Trader Paul Tudor Jones: I teach an undergrad class at the University of Virginia, and I tell my students, “I’m going to save you from going to business school. Here, you’re getting a $100k class, and I’m going to give it to you in two thoughts, okay? You don’t need to go to business school; you’ve only got to remember two things. The first is, you always want to be with whatever the predominant trend is. Tony Robbins: What’s the second thought for students? Paul Tudor Jones: 5:1 (risk /reward). Five to one means I’m risking one dollar to make five. What five to one does is allow you to have a hit ratio of 20%. I can actually be a complete imbecile. I can be wrong 80% of the time, and I’m still not going to lose. Tony Robbins: Since asset allocation is so important, let me ask you: If you couldn’t pass on any of your money to your kids but only a specific portfolio and a set of principles to guide them, what would it be? Paul Tudor Jones: I get very nervous about the retail investor, the average investor, because it’s really, really hard. If this was easy, if there was one formula, one way to do it, we’d all be zillionaires. One principle for sure would get out of anything that falls below the 200-day moving average. Jack Schwager: When did you first get interested in trading? Paul Tudor Jones: When I was in college I read an article on Richard Dennis, which made a big impression on me. I thought that Dennis had the greatest job in the world. I already had an appreciation for trading because my uncle, Billy Dunavant, was a very successful cotton trader. In 1976, after I finished college, I went to my uncle and asked him if he could help me get started as a trader. He sent me to Eli Tullis, a famous cotton trader, who lived in New Orleans. Eli is the best trader I know, he told me. I went down to see Eli and he offered me a job on the floor of the New York Cotton Exchange. More on trend following. More on Paul tudor and losers average losers.